iBlog: The 12th Philippine Blogging Summit (#iblog12) will be on September 16, 2016 at the Malcolm Theater, UP College of Law, UP Diliman, Quezon City from 8 am to 5 pm. 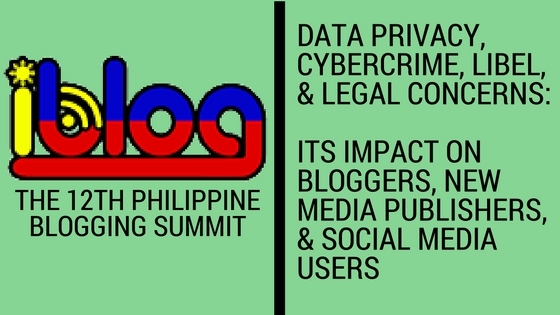 Our theme this year is on “Data Privacy, Cybercrime, Libel, and Legal Concerns: Its Impact on Bloggers, New Media Publishers, and Social Media Users”. We are thankful to GMA Network, Travelbook and Payoneer for signing up as a gold sponsor for this event. We greatly appreciate it. Also to Lazada Philippines, CheckMeOut PH, and E-Cash Content for supporting this event as a silver sponsor. We are still looking for sponsors to support this event. #iblog12 is a FREE event. It is a popular gathering of newbie, novice, and veteran bloggers, social media users, new media publishers. We tackle topics and themes that are relevant to the online community. Hi. May I get a free invite for this summit? It is a free event. Just fill up the form and you are in. I’m interested and I want to get a free invite please.Thank you! Just fill up the registration form and you are in. You could certainly see your enushtiasm within the paintings you write. The world hopes for more passionate writers such as you who are not afraid to say how they believe. At all times follow your heart. I’d love to have a free invite,please , thank you and have a good day ! “12th Philippine Blogging Summit #iblog12″ this Friday. Hi Enz. Kindly attend this Friday as a walk-in participant. See you. I’ll try to put this to good use imiedmately. kenapa saya rasa ayah najwa makin selesa memburukkan anaknya? walaupun bahasa digunakan secara halus dan hemah, tapi tindakan langsung tak berhemah sebagai seorang bapa.